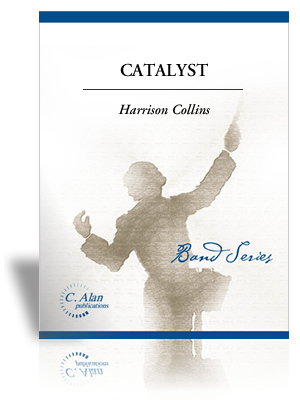 Catalyst is a fun, challenging piece that requires skill and musicality from all players. It is meant to portray the action of a "catalyst," which can be described as something that sets things in motion. This can be seen as many different things; maybe something that accelerates a chemical reaction in the tiny cells of our bodies, or maybe the spark that inspires someone to do what they love. Catalyst is a fun, challenging piece that requires skill and musicality from all players. It is meant to portray the action of a "catalyst," which can be described as something that sets things in motion. This can be seen as many different things; maybe something that accelerates a chemical reaction in the tiny cells of our bodies, or maybe the spark that inspires someone to do what they love. Catalyst is a thank-you to all the role models out there, music related and otherwise, who act as a catalyst and give the next generation the inspiration and passion to do what they love. Specifically, Catalyst is dedicated to my many band directors, who have supported me in all my musical endeavors: Donald Gee, Daniel Barber, Mike O’Glee, Andrew Blezinger, Celestino Sosa, Frank Felice, LeAndre Benton, and Meredith Carter.